Union County’s first and only public archery range was built with the generous assistance of many volunteers in the archery community. Please help keep the facility clean, safe and fun. Archers must possess a current annual Union County Archery ID Card. Archery ID Cards must be renewed annually. Year-round, daily, dawn to dusk. Must be purchased in-person at either the Westfield or Elizabeth Parks Reservation Desks. Archery Group Safety Lesson Completion Cards expire (3) three months after the date of lesson. Union County Archery ID Card must be prominently displayed on the Archer at all times. The range is open daily from dawn to dusk. Equipment permitted: longbow, re-curve and compound bow only; limit 70 lb. draw weight. Crossbow shooting is only allowed by individuals possessing a NJ State issued crossbow license for the physically challenged. ID Holders must bring ALL of their own equipment. Equipment includes but is not limited to: bows, arrows, and targets. Targets will not be supplied by range. Targets must be compatible with equipment. Personal equipment should be inspected by the individual or group and maintained for safe operation. Only target and field points are allowed on the range. No fixed or mechanical broad-heads allowed! No more than 6 arrows (1 end) will be shot at each relay. Relay time will not exceed 10 minutes. All shooting will be from the marked firing line only. Only straight in-lane shooting is permitted. No crossing shots, roving or clout. No hunting or firearms allowed. Arrow retrieval/search time per end shall not exceed 5 minutes. 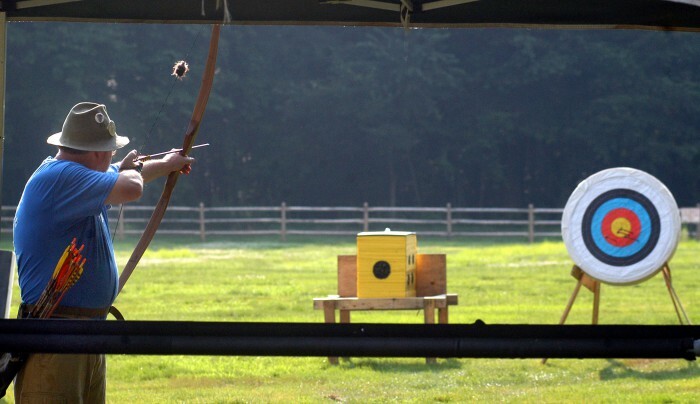 Union County Police reserve the right to confiscate any Archery ID card and revoke usage rights to any individual who does not comply with Archery Range rules. At times the Archery Range may be closed at the discretion of the County of Union. In case of emergency contact the Union County Police at (908) 654-9800. Registration Age & Class Fee: $20.00 per person In County Residents; Out of County Residents $25.00. Group Safety lessons are open to ages 9 and over. Class space is limited; registration is on a first-come, first-served basis. Walk-ons will not be accepted. Minimum 8 and maximum 16 participants per group. Union County reserves the right to cancel classes with less than 8 participants. Classes will be taught by a trained and certified USA Archery Instructor and/or a trained and certified 4-H National Archery Instructor. Lessons are 2 hours and include archery safety, proper equipment use and technique; please arrive 15 minutes early to check-in. Equipment for lessons will be provided by Union County. Upon successful completion of the class and a safety questionnaire, participants will be qualified to purchase a Union County Archery Range ID Card at an additional cost. Small Group Lessons for a minimum of 4 and a maximum of 8 are also available at a rate of In County Resident for $25 ; Out of County $30.00 and will be scheduled at mutually agreeable times. Please e-mail jstrahan@ucnj.org to schedule. Private Lessons for 4 or fewer people are also available at a rate of $100 per person and will be scheduled at mutually agreeable times. Please e-mail jstrahan@ucnj.org to schedule. Must retake safety course if ID has not been renewed after 3 years. Patrons of any Union County park and/or open space facility(ies) recognize the risks inherent in the use of said park and/or facility(ies). Other than acts on the part of the County which, if proven in an appropriate court of law, are tantamount to gross negligence, Patrons hereby agree to hold the County harmless from any and all damage resulting to person and/or property from the use of its park and/or open space facilities and hereby releases, waives and forever discharges the County , its servants, agents and/or employees from any and all such claims.